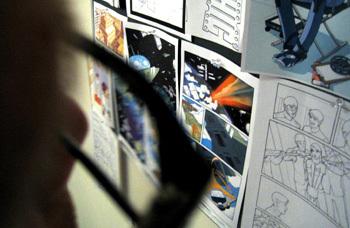 THE MAKING OF MY COMIC BOOK IDEA - FROM CONCEPTION TO PUBLICATION. No word on my submissions packet yet, so Bax and I are still charging ahead on the series. For the entire month of February I was in Italy, but that didn't stop us from going back-n-forth on a few ideas. And, I got really hung-up on the layout for page 9. It's a one page flashback that reveal that part of Lucy's seizures. Each panel zooms out a little more. Above was the initial layout - which was good, but not quite what I had pictured in my mind. So I grabbed one of my reporters and had her go out in the freezing NBC parking garage and model for me. Here's some photos I did as examples for page 9. I made my reporter go lie out on the floor in the freezing parking garage and pose for these shots. She's no actress, but I hope you see the "dead on" view I'm hoping for. The photos look great! Probably the cold floor helped her in making the dead-with-eyes-open face. Poor thing. I reworked the layout. I love the way you made the panels shrink as the camera zooms out. If you donÂ´t mind, I followed very close to what you did with the pics. There were 4 panels in the script, but as the letters are captions only, we can work them in 3 panels and we get to have a veryy big shot of LucyÂ´s seizure face. Again, I liked the layouts, but I'm think the 'angle' should be right on the floor. I used to have seizures and one thing I always remember is waking up with my face on the floor. Attached is a new version of page 9. I took a few photos of myself trying to figure out how to keep the point of view very low. Then I noticed that floor lines help create depth, so I added those. What do you think? It's time to "put up or shut up" as they say. So, here it is in all its glory...the Image submissions packet. I put everything together into a binder, got it all organized, and am hoping for the best. I'll cross my fingers for a little while, but then it's back to the typewriter (figuratively) as we keep on cranking out pages. Thanks for all the emails and encouragement! I'll keep you all posted! Okay, so as the preview isse nears completion I decided to try my hand at lettering the issue. I think I've done a pretty swell job, but when I rendered out this page to show y'all it come out a little "stripped down" when I did the output to a jpeg. Anyway, you get the picture. There's a buch of stuff going on "behind the scenes" in Anamorphic land, but there hasn't been a whole lot to blog about. We are getting very close to getting our submissions stuff in the mail - more on that later. I'm kinda at the point where I'm not gonna post every single new page we get finished, but the other day Bax sent me some great stuff for the blog. Along with page 2 of the preview issue, she sent her various stages of work, so you can see how it came together. And, then the final pencils (with some added line weights). I've been showing a ton of concept art and pages from the upcoming books, but there's one thing that's definitely been lacking. So, in honor of my much-neglected robot character, I've decided to let you peek at Gaffer's interview page for the Anamorphic preview book. There's no dialogue, but you'll probably be able to tell from the sketches that he's probably screwing stuff up. Gotta love him! Here's a quick look at how Bax and I work together on plotting out how a panel ends up looking. For the most part, I'll write what's happening in the panel and she'll draw it. But, there's a bunch of instances where I'll have something specific in mind and we'll go back and forth, making various changes. This is a wide, expansive shot of the engineering room. Nik is standing at the edge of a platform in the massive engineering section of the ship. It’s dark and scary in there. Nik is nervously fixing a maintenance panel near the door, and from the area to the side of the platform, scary spider-like legs are crawling up from the pit below. NIK: The ship wouldn’t be half as hard to repair if I was allowed to go into the tech core. NIK: But, as long as it’s home to an Xhekvarian Dragon, I’ll just have to work around it. Which is pretty good, but for some reason I pictured the shot being more of a "side view" (like an old school video game). There's two other panels later in the preview issue that'll have the same look, so I thought it was important enough to change. "Here's my idea for panel 3, with the monster coming up from below. I was thinking of a little more of a side view, and him a little more unaware of what's going on. Of course, my drawing is horrible - but maybe it'll help you." "Hehe, your drawing was great. The tentacles were the best. The point of view makes it look like and old 8-bit adventure game. =)"
There you go! That's a basic panel progression - although most of the time, I just write it, she draws it, and we're good. Anyway, I'll show you the final panel as soon as it's done. Later! Bill from Lithium Pro sent me the lettering for pages 1-5, and they are sweet. Here's a low-res glimpse of page one. And, here's a close-up of the 'film motif' he did for captions. Pretty rad! We now have a complete sumbission packet. Sabrina is working on coloring the extra pages, while Bax sketches out the preview issue. Bax started doing the layouts for the preview issue. It'll be 8 new pages of art, and probably a cover image. She usually works 4-5 pages at a time, and then finishes them up. The whole issue is done like a documentary film about the crew of the Anamorphic, where each member of the crew talks about their various jobs. So here's a little peek at the first batch. I'll post some comparisons to the final pages soon. I sent a few suggestions for panel layouts and stuff. I'll show you all that as bax send back more stuff. Not the highest resolution scan, but I hope it's a little bit readable. Okay, so I've been looking over everything and we're in pretty good shape! The website needed a little attention, so I'm messing with the template a little bit. 1. Typewritten cover letter with all contact information. 2. Typed, one page, synopsis of the over-all story. 4. Cover mock-up, with logo placement. We're waiting on the lettered part of the first 5 pages, and the submissions stuff is ready to go. And we're darn close to the Dark Horse requirements, as well. But we're adding an additional 5 pages to the mix, and quite possibly the eight page preview issue now. We were gonna use it to introduce readers to the characters and setting of Anamorphic, so why not use it on the edtors as well? That's the update on the project today. Sabrina is working on some great colored pages that'll be going up very soon. And, Bax is getting the preview issue layouts all planned out. And I'm working on the website! Since the story is sorta told by Lucy, the 20th century goth chick, we decided to make the website URL something that specific to her. Hence, the website now has a handy marketing domain: thefuturesucks.net! All the pages for for the 11-15 sequence are done, but we're currently discussing a small detail about page 12. "Now, the only thing bothering me is Evelyn´s main panel in page 12. I going to give it one more try (I did a different version that I didn´t like - I don´t think I even sent you) and we´re done with these pages." "...new panel on page 12. I like it, but I don´t know if I like it more than the first version!" I think the first one is probably the strongest first iimpression for Evelyn - and my favorite. Although, I like the latest one a lot. There's some continuity errors with Evelyn eye in the last few pages, but it's already been taken care of, I probably won't post the updated pages. At this point, we're only waiting on the lettered pages to come back and the submission packet for image, darkhorse, and some other fine publishers is ready to go! I was toying around with cover mock-ups for the submissions packet. I want to do something with a widescreen look (which would be cool, considering the book is called Anamorphic). The newest page has arrived, and Evelyn's introduction sequence (pages 11-15) is coming together quite nicely. No word yet on the lettered pages, but I'm hoping to post them in the next week or so. Bax sent me a new page today in the 'Evelyn introduction' sequence. Bill from Lithium Pro sent me the logo final - in four different variations (red, white, black, and white/red). I decided to go with solid color logos, over stuff with gradient colors. Seems more bold and confident, is my reasoning. I'm gonna revamp the site and make some cover variations now. While I'm doing that, Bill is doing the lettering, Julia is drawing 5 more pages, and Sabrina is coloring pages and promo art. It's all coming together! Sabrina just colored one of our pin-ups, to be used as some promo art or cover art for the book. Also: the logo is officialy done, and I'll post it here in the next day or so - along with a site revamp. Attached are 4 color variations, two I went on a tangent from the last version and used a different approach, the other two I went to a sepia hue and a steel blue hue -of which I like the best. I'm working now on a variation in the line art a bit to add a more retro feel to the surrounding drop shadow and maybe try to eliminate using black in the logo itself, as it will usually sit on black. The logos are in order of my most favorite right now - which changes every few minutes, since they're all good. But, I've already sent him two emails with different preferences, so I can't change my mind back now. And, she's gonna go back and "upgrade" page 2. Can't wait to see what she does. Here's a few more pages from Evelyn's introduction scene (pages 11-15). This is the page layout Bax sent me (based on the script below). This is a condensed version of the page script (I took out the dialogue and some stuff that won't make much sense at this point). Set amongst a nearly endless sea, is a futuristic maximum security facility. It looks like one of those off-shore oil drilling stations. The last part of dialogue from the previous scene carries over into the first panel of this page. The caption is in the bottom corner of the panel. Orson is standing in lobby/security office, The place is swamped with monitors and has a very military/prison look. There's a few ARMED GUARDS nearby. Orson is standing with the security captain, who does all that talking. They’re a large wall of monitors and security equipment by them (it comes into play later in the scene). This is small panel that shows the guard's hand pointing at a layout of the building. It’s reminiscent of the big blueprint of the Enterprise that Geordi always referred to in ST:TNG. There's an underwater elevator that goes all the way to a complex on the ocean floor. A big, wide panel showing Orson and the guard talking near the bank of monitors. Evelyn's "mug shot" is displayed on a large screen. Reverse shot close-up of guard, as he continues to insult everything that is dear to Orson. Panel 1 - Im thinking that the prison building should be off to the right more, so we can make more room for captions...and it seems more cinematic...This panel is just a short introductory panel. It can be much thinner, since the rest of the page is way more important anyway. In the layouts, i kinda shorteneted it up (but acciendtly cropped out the space car). It can be even thinner than that. panel 5 - this is the one that bugs me the most, but it's all my fault. I think that we shouldn't reveal Evelyn until the next page. The security camera shot takes the punch out her introduction. What do you think about making panel 4 bigger and I'll just pour the dialogue into that panel. This'll effect the layout of the page, so think it over and get back to me. panels 6/7 - I made these horizontal. I thought they looked too weird back-to-back, and looking in opposite directions. If you kept panel 5 where it's at, but made it wider, then these panels should be fine if they were scrunched over a little bit to make room. Page 12's revisions were much less dramatic, but I might post them soon if I don't have any logos or colored pages later this week. Here's a link back to the uncolored version. Space isn't the final frontier - it's FILM!! Follow the crew of The Anamorphic as they blast into space on a mission: do whatever it takes to get their independent film made. This weblog charts the progression of my comic book idea through every stage of production, until the day it hits store shelves.